January 2016 was the quietest month so far in Dimitrovgrad since September 2015. About 2000 refugees passed through the registration camp, 70% Afghans, 25% Iraqis (mostly Yazidi), the rest Syrians plus an occasional non-SIA migrant from Bangladesh, Pakistan or Iran. After a very slow start of the year, numbers picked up to about 100-150 per day. The beginning of 2016 was very slow in Dimitrovgrad. The refugee influx was almost non existing in the first days of the new year. The town was snowed in and temperatures were very low (up to -12C overnight). The extended NYE holidays on both sides of the border and especially a start of the hunting season in Bulgaria (which scared refugees who are using forest tracks) lead to decreasing number of refugees averaging about 20-30 daily. Dimitrovgrad is a small town in Serbia of 12,000 inhabitants and located near the Bulgarian border. Since the beginning of last summer, 100 to 200 refugees arrive in Dimitrovgrad every single day coming from Bulgaria. Due to the short distance to Sofia (the capital of Bulgaria), Dimitrovgrad is currently the most important hotspot for migrants crossing the Serbian-Bulgarian border. Refugees traveling through Bulgaria usually enter Bulgaria near the Turkish town Edirne. After Bulgaria they usually cross Serbia, Croatia, Slovenia, Austria and stay in Germany, or they go further to Belgium, Netherlands, the UK or the Scandinavian countries. Most of the refugees arriving in Dimitrovgrad end up there, because the did not have enough money for the passage from Turkey to one of the Greek islands, which requires at least 1.000 EUR per person for paying the smugglers operating the boats. Solidarity with the protesters and hunger strikers in Idomeni! We are currently setting up an Infopoint for the people who are pushed back at the Greek-Macedonian Border in Idomeni. In order to show the people who are protesting that their calls are being heard and their struggle is recognised in Europe and across the world, we are asking for individuals and groups to send statements of solidarity: small moments of support for those fighting for their freedom of movement. Declarations of unity to those struggling against Fortress Europe. Send us whatever sign of support comes to your mind. We will be present in Idomeni with printer, megaphone and camera. We will print all statement, photographs and poems. Play the words of solidarity. And report back on what happens. Let us prove that no fence, no wall and no military presence can seal borders. Let us be there to show support and solidarity to those in struggle. And if not in person, than in word, picture and sound. Send us your solidarity call to freemovementinfocar@riseup.net! Walls fall only when those shaking their foundations are being heard! Yellow vests against police violence! All of us have played an important role within all the last weeks and months in keeping the “corridor” open. It was us who have been on the side of the people when they had been waiting in the rainy nights, when procedures slowed down. We come from various backgrounds, but what we all shared is the will to get active and to welcome those who are travelling. But now the empire strikes back: Since 19th of November parallel procedures of selection started at the borders to Macedonia, Croatia and Slovenia. From Welcome to Europe we have accompanied struggles for freedom of movement be it on the islands of arrivals, be it around detention camps or at the ferry ports to exit Greece, be it for those on the move against the Dublin-regulation when they escaped for example from Hungary. What we learned is that the success of every protest, every hungerstrike, every collective move depends on visibility and people who take a stand on the side of the protestors. We are doing this kind of support since some years and we know out of this experience: Especially after the dynamics created „in the long summer of migration“ it is quite for sure, that there will be uprisings the next days. Can someone really believe, that the people will go back or „get up in smoke“? There are already the first pictures from protests at the Macedonian border. Struggels and protests at the border crossing point of Eidomeni since 21th of November. since the beginning of November there has been a mobile info point at the petrol station in Adaševci close to Šid, at the border from Serbia to Croatia. We have to leave Šid this Wedenesday, the 25th, but we are looking for people who want to continue with this in the next weeks. We handed out information leaflets about the Balkan route in English, Arabic, Farsi, Pashtu and Urdu. We also set up a charging station for mobile phones run by car batteries and set up a free wifi hotspot. And of course we answered questions and had conversations together. On this blog, we publish information we receive from various sources on the Balkan. Either we know these sources personally or we strongly believe (by cross-checking the information with our own experiences in the field) that they are trustworthy. More detailed reports can be found on bordermonitoring.eu. 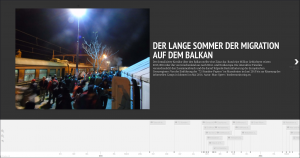 And please have a look to w2eu live feed as well, where permanently updated and verified information for people travelling on the balkanroute is published. Apart from that, (updated) information can be found by the links.